If you follow the path of direct realization Tantra, you will discover for yourself that the entire cosmos is nothing but consciousness and energy. There is feeling-awareness and there is the power that creates. 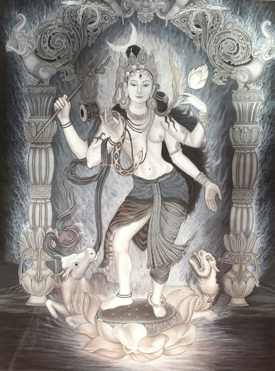 Shiva is the personification of feeling-awareness, and Shakti is the personification of creative power. This world is Her body. Consciousness and energy, or Shiva and Shakti, are not really separate. For instance, you can talk about the movement, color and heat of a fire. These are simultaneously attributes of the fire and the fire itself. Fire and its expressions are inseparable. Just so, you can experience Shakti, the manifest world in all of its variety. You can describe attributes of this world. But this variety and those attributes are inseparable from feeling-consciousness. The unison of Shiva and Shakti is the Supreme Reality. Shiva and Shakti are one, but they have the power, the freedom and the wisdom to appear in various ways. All beings and all worlds are expressions of this never-ending life process of Shiva-Shakti. You, however, most likely are not yet fully experiencing the freedom to appear in various ways. In fact, unless you have been practicing in a spiritual tradition for a long time, it is probable that you find it difficult to change even small habits of body, emotion and mind. Accomplished yoginis and yogis, however, are fluid and adaptable. Their responses are a dazzling play of light on water. This is one aspect of Self-realization—you become more expressive of the freedom of Shiva and Shakti. You discover the effulgent, creative freedom of Self. Our world is expressive. Reality, in its very life process, expresses itself. There is a communicative aspect. We call this duality. Duality is the world of you, me, dog, river, tree and donut. Things appearing as distinct entities—that’s duality. Only because the one continuous field of consciousness and energy is free to appear as many is this magnificent theater of communication possible. Some spiritual traditions are “transcendental.” They teach that there is something impure or unreal about our everyday world. Students of those traditions want to “rise above” duality. From the perspective of direct realization Tantra, the only impurity is our ignorance of our real nature. Even this ignorance is a natural phase of the life process of Shiva-Shakti. Duality only feels like a curse when we are convinced that we are condemned to separateness. Our experience of being separate is the root of all suffering. We want to stop suffering, but we do not need to reject life in order to accomplish that. Tantra is not a religion or a belief system. It is a spiritual technology for entering into full participation in Reality. Any direct realization teacher worth a nickel will tell you that belief is irrelevant. Confidence and practice are what count. Through practice and interacting with our teachers, we gain confidence in the life process and an embodied understanding of our world. We discover Reality for ourselves. Embodied knowledge means useable knowledge, not conceptual knowing. The search for ultimate truth and knowing is a dead end, in this View. The essential characteristic of the universe is openness, or infinite potential. This cannot be known in the usual sense. But it can be embodied with awareness. And that is a very sweet fruit indeed. In order to realize, in our own human lives, the fullness of Reality, we have to change. We have to change, not just our ideas about life, but the View of ourselves and the world that shapes us down to the very cells of our bodies. This profound process begins concretely with changing our daily conduct. Direct realization Tantra is a practice that is thoroughly embedded in our everyday lives. The practices of direct realization Tantra ritualize every aspect of life in order to recalibrate the sadhik (practitioner) and re-sync her with the rhythms of the natural state. Tantra ritualizes your life from the moment you open your eyes in the morning, throughout your whole day, as you fall asleep, while you are sleeping and until you open your eyes again the following day. Authentic Tantrik practice will pull from you everything you thought you had to offer and then some. No part of you will be left out. No aspect of your life will remain unchanged.